Please note: Between last night’s barbecue and this morning’s onion burger, there was a simple breakfast burrito. Don’t worry, faithful followers – we did NOT skip a meal. The other place mentioned by the reception desk at the hotel in Oklahoma City (OKC) was Nic’s Grill – a place I had on my itinerary for their onion-fried burger. But, Nic’s didn’t open until 11:00 and I wanted to be on the road by 9:00. Consulting the oracle (the Hamburger America app), I looked for similar options heading south, toward Dallas. 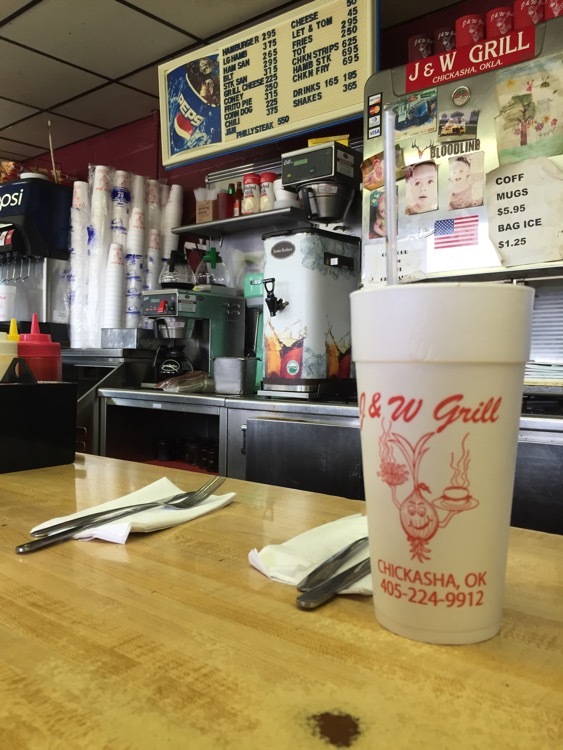 J&W Grill is in Chickasha, about forty-five minutes southwest of OKC, and seemed to fit the bill. After dealing with a cooler emergency, we arrived around 10:30, to find that they were still serving breakfast. Or we could get burgers. Burgers it would be. We took a couple of seats at the counter and discussed the possibility of splitting a burger, but decided instead on a burger each, no fries. 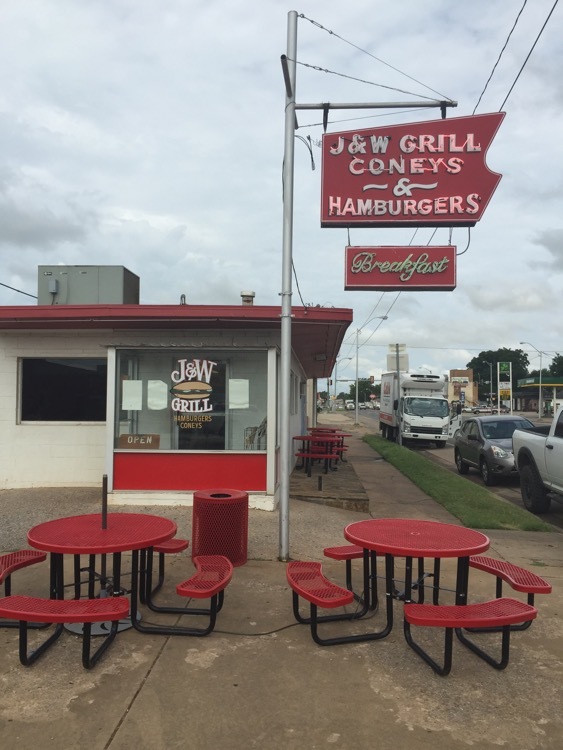 According to the Hamburger America book, J&W Grill is a historically significant griddle in the annals of the Oklahoma fried onion burger. 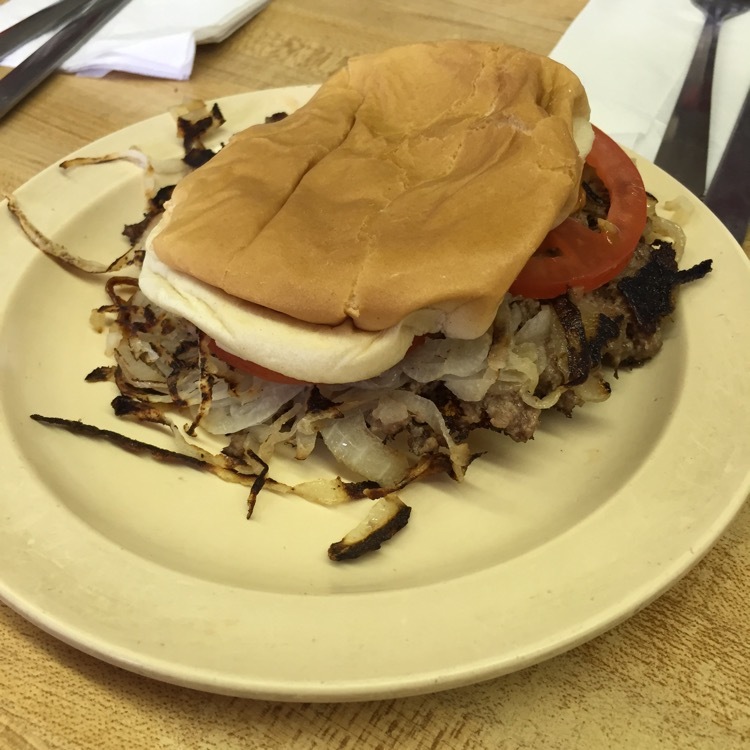 Fried onion burgers were created in the 1920s, along with the Depression-era burgers of Mississippi (which had bread mixed with the ground beef) and the epicenter of the fried onion burger universe was El Reno, Oklahoma. In 1957, the W of J&W left El Reno, moved south to Chickasha and started serving the onion burgers there. 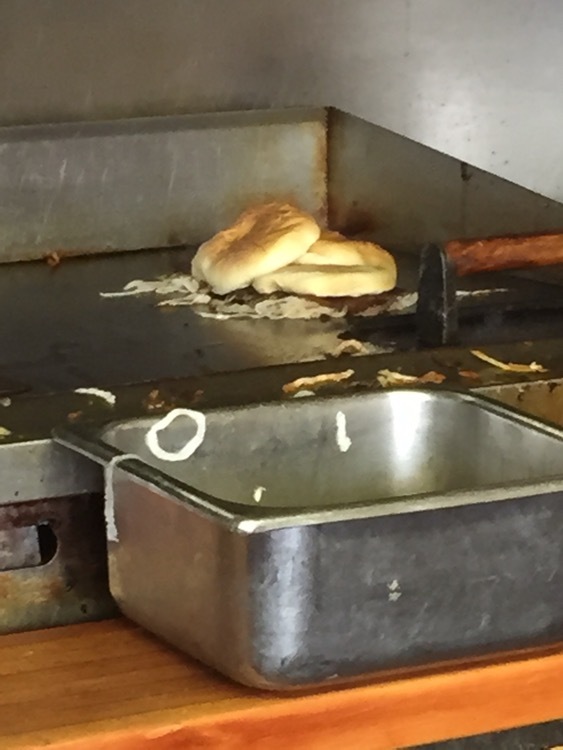 See the burger and onions on the grill (the burger is under the bun)? How did it taste? Like onions flavored with ground beef. Maybe cheese would have helped (the tomato did not). Or maybe onion fried burgers just aren’t for me. Southward we go. You weren’t supposed to have tomato on your O.F.burger, nor cheese – just keep adding salt and pepper with some mustard ’til you get it right. And it’s Nic’s, not Nick’s, so, no – obviously our onion-fried delicacies are NOT for you, so go back where you came from and leave the good stuff to us! 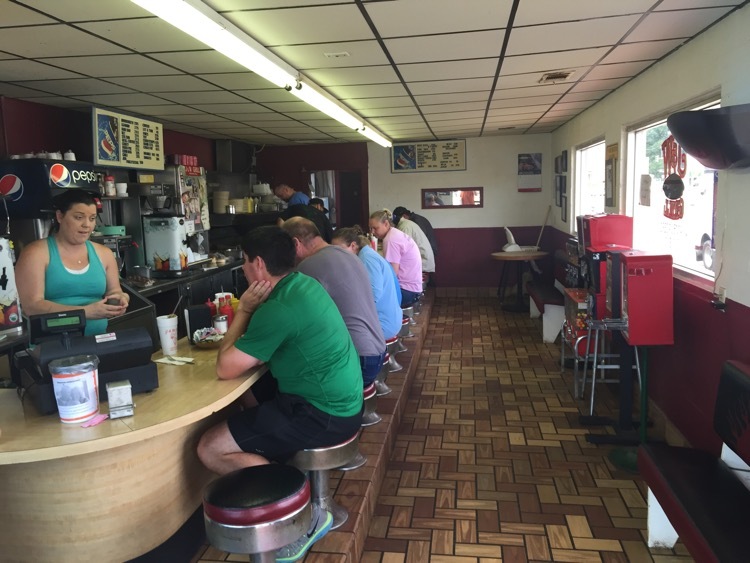 You know, I’ve always heard that Oklahomans were known for their hospitality…. Thanks for the correction on the spelling of Nic’s. I’ll fix that.